Rejuvenate your smile with porcelain veneers from Corporate Center Dental Care. Call our Lexington, KY today at (859) 223-4644 to schedule a consultation! If you are the patient looking for a life “changing experience”, porcelain veneers may be your answer to the beautiful smile you have always dreamed of. Porcelain veneers can erase discolored, cracked or worn down teeth in only two short visits. The ultra-thin porcelain material allows your smile to be lifted to a new level while retaining your natural teeth. Veneers are custom-made porcelain coverings which are fitted over the natural teeth to give you the gorgeous smile you have always wanted. 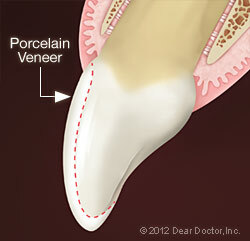 Porcelain veneers can be placed adjacent to natural tooth structure with little or no difference. Porcelain reflects light in the same manner as natural tooth structure and is stain resistant. Everyone will notice your beautiful smile for years to come. These handcrafted porcelain restorations can not only change your appearance but enhance your personality and retain your confidence. Drs. Feck and Combs will help you choose a smile design that compliments your facial features and skin tone. A skilled ceramist will work closely with our doctors to create your most natural looking smile. You will wear beautiful treatment veneers while your porcelain veneers are customized for you. Our laboratory prides itself on American made products using only FDA approved materials. Your laboratory work will never be sent to foreign countries where dangerous chemicals, such as lead and mercury are not regulated. We pledge to deliver you quality safe restorations. These handcrafted restorations can conceal imperfections in your smile that only you and the doctor will know. 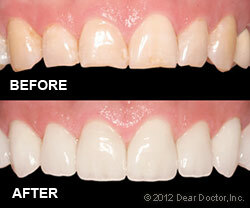 If your beautiful smile is hiding behind stains, chips, or gaps let Drs. Anthony Feck and Maxie Combs create the smile you deserve.